WAGO has introduced the MCS MAXI 832 Series, the world’s first lever-actuated PCB connector for high-power applications (up to 66 A / 600 V, and up to 4 AWG conductors). The MCS MAXI 832 Series extends WAGO’s wire-to-board and wire-to-wire pluggable solutions at the high-power end of the range. As part of our Multi Connection System family of pluggables, the tool-free, Push-in CAGE CLAMP 832 Series with lever operation has high current and voltage capacity relative to its size, according to its maker. These touch-proof connectors (even in unmated condition) feature low mating forces yet high contact forces between mating components for safe, reliable pluggable connections. It also features flexible coding, making for easy and quick coding changes even after the connector is already installed. The MCS MAXI 832 Series’ lever operation is exclusive to WAGO in the field of power electronics interconnections, offering the only completely tool-free, in-hand wiring solution for wire sizes 18 to 4 AWG. The MCS MAXI 832 Series features wire-to-board and wire-to-wire configurations in two to six pole variants, and is available September 2018. 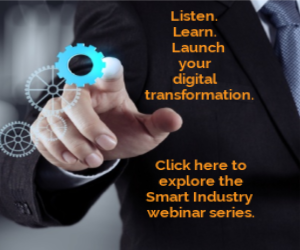 We’re thinking about your digital transformation…are you? Click here to learn more about Smart Industry 2018.